I don't know whether the hold up means they have to hurry to get through the NWP. How long do they have, a good month? Depending on wind direction another obstacle might develop as I have indicated on todays MODIS. the red cross marks the approximate position of Northabout. Judging by Ousland's blog they're a few days ahead of his progress in 2010. He was at 76.60189 N, 112.68207 E on the 17th Aug. They encountered a storm on about the 21st by the New Siberian islands. I meant to check up on this. Thanks, Phil. If they're ahead of Ousland's schedule, they have a good chance of making it. They've done everything right so far. Any updates from Goddard/Heller yet? Any updates from Goddard/Heller yet? Since you ask, "southwest winds never occurred at lower CO2 levels". Just the usual nonsense, shifted his story from 'blocked by hundreds of miles of 1-2 meter thick ice' to 'strong southwest winds over the past two days pushed the ice far off shore', which of course is said to be perfectly normal and unrelated to global warming. Ousland reached the international date line about the 1st September, so we'll see what the relative performance is by then. Yesterday morning Watts went on the record and made an unambiguous statement that there is no Arctic cyclone and that it is only the product of my (deranged) imagination. Willard Watts...the gift that keeps on giving. If Monday's JMA 144Z comes to fruition, there is a possible blue Arctic this fall which no sane person desires...check out the 104.2 hPa high over Greenland! If so inclined, prayers to the deity of your choice is in order. Ousland was at the point where Northabout is now on 19th Aug so about three days leeway. Northabout starting to swing to the north to round the Lena delta. I have been watching the Laptev Sea area from about 8/13 through the intensification process of GAC 2016 (if that is what it is being called) and now a few days after. Winds (per Null school) seem to have blown consistently and quite strongly out into Laptev and towards the New Siberian Islands yet per Daily AMSR2 Sea Ice Maps, the ice does not seem to have moved very much. I am a bit of noob here, having lurked around the forums since ‘12, so hope this is not too dumb a question but don’t quite understand why the ice did not clear a bit more out of Northern Sea route and drift towards the east. Is there a shoal or bank in this part of Laptev that keeps the ice from moving with wind? Thanks for any insight. Northabout encountered some ice and a sandbar resulting in several manuevers around the obstacles. He also mentioned being surprised about how many people were "watching" them. I recall Ousland mentioning shallow water off the delta when he was in this part of the trip. Northabout still ahead of Ousland's position in 2010, also as he had to put into Pevek for a couple of days, is likely to remain so. Closing in on the Lyakhovsky islands which Ousland passed on Aug 23rd. "Northabout Races for the Date Line"
If the boundary between the Laptev Sea and the East Siberian Sea is marked by the New Siberian Islands then it is no longer metaphorical. The Northabout has passed east of Ostrov Bolshoy Layskhovskiy so I think we can say it is now literally in the East Siberian Sea. They haven't posted images lately to show how much or how little ice they are encountering along the way now. Seems to me the massive storm has to be as much of a concern as the ice at this stage of their voyage. Looks like they're heading south at 165º, presumably to round that patch of ice (9)? worldview has a clear image of this area http://go.nasa.gov/2bKPZlY, it seems they are near the southern edge of it now if the projection of the track map http://polarocean.co.uk/tracking/ is similar enough. From the track map it looks like they stopped briefly at 180 long. 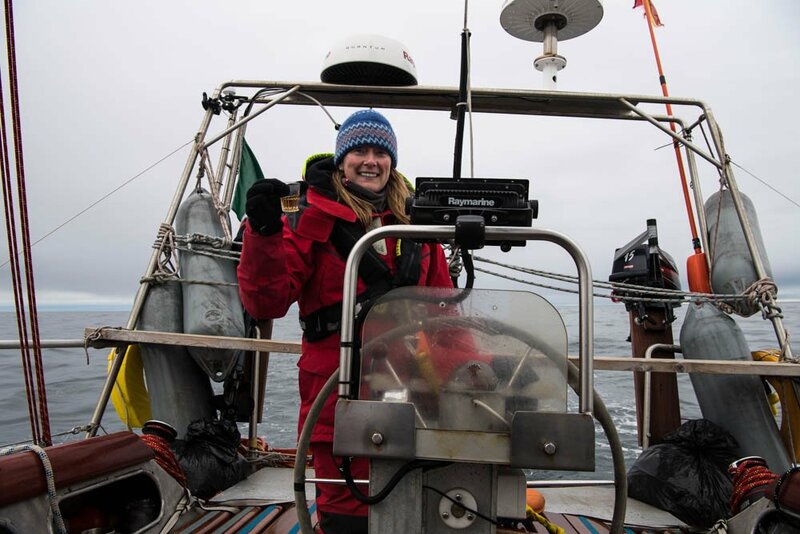 Probably a well deserved celebration and ceremony for crossing the date line. Looks like they're about to enter Barrow. At this moment, they appear to be anchored just outside of North Salt Lagoon, which contains the single pier of Barrow harbor (at least that's how I interpret the images). I thought at first they were blowing by Barrow, but no. To get to the harbor, they had to go around Point Barrow, and then come back in from the other side. Sailing downwind in a fore & aft rigged boat, with following seas, is never pleasant. I'd assume that with all the bergy-bits and growlers that scudding off on a series of fast broad tacks was out of the question. Seems like a great time to get some shore rest, do some repairs, & buy a gimbal for their stove. They had a planned stop over in Barrow for resupply, maintenance and crew change. Since Northabout is no longer voyaging along the NSR, perhaps we might continue that conversation on the NWP thread? Dont know if its the best place - but this evening Channel 5 (uk) has been showing an interesting 2012 documentary about the arctic icebreaking tanker en route for oil & icebreaker development Route is to Varandey terminal, on the coast of the Barents Sea & the trip was in March. The Northern Fleet moves into its new premises at Kotelny, the New Siberian Islands. Several more Arctic bases will be opened shortly, military representatives say. It's all go on the NSR news front today! The volume of seaborne cargo shipped in transit along the Northern Sea Route, as of December 1, 2016 reached 6.9 million tonnes, an official of the Ministry of Economic Development of Russia said Tuesday. Alexander Cybulski, Deputy Minister of Economic Development of Russia, speaking at a session of the state commission on development of the Arctic zone of the Russian Federation said that was a record figure. A spokesman for Rosmorport has announced the icebreakers will delay a return until probably May or early June. 'The vessels will remain for the winter because of the very heavy severe ice conditions,' he said. 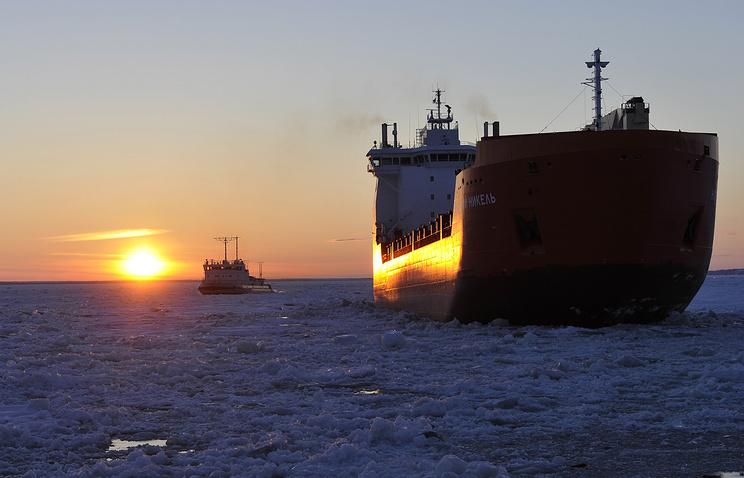 All the vessel got out of the ice, and three of them - Captain Dranitsyn and the two cargo ships - returned to Pevek. The Admiral Makarov moved further east to continue working for Rosmorport in clearing sea routes. Officials said the icebreakers could have gone further through the ice but there was 'a very high risk of significant damage' to the supply ships, and it was decided to postpone the return to Archangelsk. The Shturman Ovtsyn set course for the history books when it in late December left the yard of the Samsung Heavy Industries in South Korea. On 21st December, it made it through the Bering Strait and into the Chukchi Sea in a convoy escorted by nuclear-powered icebreaker 50 Years of Victory. Two other vessels, the heavy load carrier Audax and general cargo ship Arktika-1, were also part of the convoy. On 3rd January, the ships arrived in the Gulf of Ob. While the Audax and Arktika-1 docked in Sabetta, the port on the northern end of the Yamal Peninsula, the Shturman Ovtsyn singlehandedly proceeded deeper into the gulf to Cape Kamenny and the Novy Port oil terminal. It was a unique and unprecedented operation. Never before has such a convoy crossed through the Northern Sea Route, from the east to the west, at this time of year. On 29th January, the Shturman Albanov picked up oil from Gazprom Neft’s Arctic Gate terminal off the coast of Cape Kamenny. That marked the first one million tons of oil shipped from the terminal. Welcome to a commercial Arctic. "Never before has such a convoy crossed through the Northern Sea Route, from the east to the west, at this time of year." That's an interesting point. Was there a previous winter crossing from the west to the east? Why would that be easier? Was there a previous winter crossing from the west to the east? Not that rings any bells in my ageing brain, but I may do my due diligence when I have a spare 5 minutes. Because the Vilkitsky Strait is the furthest north "choke point" on the NSR, and you pass through there earlier heading west to east? By a funny coincidence (! ), news outlets in Iceland are today reporting that the Bremen Port Authority has received green light from the Bremen authorities (the senate of the Freie Hansestadt Bremen) to go ahead with preparing the construction of a massive port facility and container terminal in North-Eastern Iceland. This project has been ongoing for some time, mostly in the discussion stage, but now with the go-ahead from the Bremen city senate, the project moves to the next phase. The purpose of the port facility is solely to open op for shipping by special-built arctic container vessels between the port in Iceland and a matching facility on the Pacific side, most likely in Kamchatka. P.S. Has anybody else seen "Trapped"? Russia, earlier this year sent a convoy, east to west, from Archangel to Pevek. Technically not a passage through but close enough. This route was also used in Soviet times. They seem to have become stuck on the return trip, just about the time the early January storm was moving most of the ice mass west. Referance: Atlas Obscura. I also read something in a translated Russian article but do not remember what it was from. Might this be the one you're thinking of? They arrived at the port of Vostochny http://www.vostport.ru/en/ so I guess a delicate load like this isn't too much of a worry nowadays. Looking at the transit statistics, it seems that there has been a sharp fall between 2013 ( 71 vessels) and 2014 (22 vessels). Why? The traffic on the Northern Transport Corridor that includes arctic seas from the Barents and the White to the Chukchi and the Bering seas can reach 75 mln tons per year to 2025, reported to TASS Mikhail Grigoryev, the member of the Scientific Council of the Russian Academy of Sciences in geology issues and development of oil, gas and coal. “We have analyzed the extent of companies’ production on approved development projects and seen if applied projects – “Arctic LNG”, shipment of coal from “Chaika” terminal, “Pechora LNG” - are additionally implemented, to 2025 the traffic in the Arctic waters (including the NSR) concerned with the development of mineral resources will reach around 75 mln tons per year”, said Mr. Grigoryev prior to the 2nd International Conference “Arctic-2017”, that takes place on 16-17th of February in Moscow. As he said, overall traffic on the NSR in 2016 exceed 7 mln tons and in North East passage – 18 mln tons. “International transit via the NSR in 2016 has reached to 240 th. tons. This amount does not include pass-through voyages, when a vessel sails through all the Route and calls in an arctic port for cargo delivery. The export of hydrocarbon raw materials arranged the main cargo flow. 8 mln tons was exported from Varandey port in the Pechora Sea, 2 mln tons of cargo flow were provided by Prirazlomnaya oil platform, around 3 mln tones gave Novyy Port”, said Mr. Grigoryev. Hydrocarbon traffic on the NSR, according to experts, should reach 40 mln tons by 2022. Mr.Grigoryev precised that the amount includes only those projects that have existing development projects, almost 25 mln tons will be compiled in the Ob Bay. I wonder how those "ice bound icebreakers" are coping with the latest developments near Chaunskaya Bay? The cargo turnover along the Northern Sea Route (NSR) in 2016 reached a level above the previous record of 6.9 million tons, and by 2020 it may reach 31 million tons depending on development of the Yuzhno-Tambeyskoye gas field and further development of Yamal’s deposits, FESCO’s (Far East Shipping Company) Head of the Fleet Department Vladimir Chabrov told TASS on Monday. "The Ministry of Economic Development reports a record level of cargo turnover along the Northern Sea Route in 2016 - as of December 1, 2016, 6.9 million tons were transported there, which is a record in that transport corridor’s history, including the Soviet times," he said. "Due to stages of developing the Yuzhno-Tambeyskoye gas field and to further development of nearby hydrocarbon deposits in Yamal, the cargo turnover may reach 31 million tons by 2020 already. The biggest part of the cargo would be raw material from the Prirazlomnoye and Port Sabetta fields." Such a powerful image, Jim. Russia is owning the Arctic. The 80,000 tonne-capacity Christophe de Margerie, an ice-class tanker fitted out to transport liquefied natural gas, docked in the icy port of Sabetta, with Russian President Vladimir Putin watching via live video-link. Putin congratulated the crew and energy company officials gathered on the ship's bridge, saying: "This is a big event in the opening up of the Arctic." The South Korean-built vessel was not picking up a cargo on its maiden voyage, but will eventually be used to transport gas from Russia's Yamal LNG plant, which is near the port.